Universal Constant: Are you the "Historic-Denier"
"Those that fail to learn from history, are doomed to repeat it." The Earth rotates, our Moon orbits, both circle the Sun, the solar system flows within the Galaxy and the Milky Way drifts through the Universe. Some observe "change" in patterns - our lifecycle, ocean tides, seasons, sunrises and sunsets - there is a basic rhythm and circular order. Though seasons repeat and the Sun always rises, each Summer is unique, every Sunset, one of a kind. Flow patterns have similar signs, yet every journey is singular. 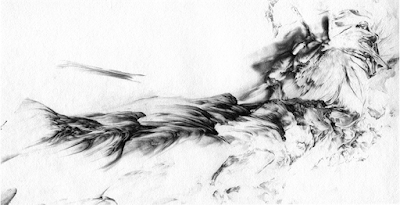 Even though we live within the turbulence, recognizing the past in our future is challenging. The establishment doesn't like change. "Progress, far from consisting in change, depends on retentiveness. When change is absolute there remains no being to improve and no direction is set for possible improvement: and when experience is not retained, as among savages, infancy is perpetual. Those who cannot remember the past are condemned to repeat it." "Tsk. 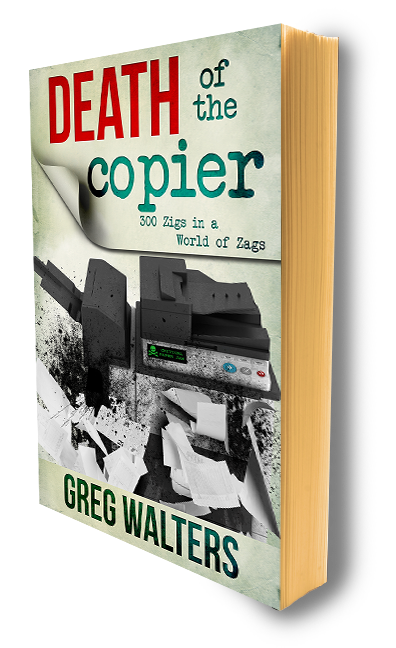 Death of the Copier? Come on, the OEMs will be around forever and people need to make copies. Who let this guy in?" - Some print/copier dude, Lyra, 2009. We've all been here before - as a society and as the human race - today it's the internet, a century ago it was the telegraph. Today it's iPADs, yesterday it was chalk. There have always been visionaries, there will always be Ludittes. As further illustration, consider the following list discovered years ago via Fred Kemp, a professor in Texas, by way of Collins and Halverson and originally presented by Dave Thornburg and David Dwyer. They're describing resistance to change. I know you'll see parallels. From a principal's publication in 1815: "Students today depend on paper too much. They don't know how to write on a slate without getting chalk dust all over themselves. They can't clean a slate properly. What will they do when they run out of paper?" From the journal of the National Association of Teachers, 1907: "Students today depend too much upon ink. They don't know how to use a pen knife to sharpen a pencil. Pen and ink will never replace the pencil." From Rural American Teacher, 1928: "Students today depend upon store bought ink. They don't know how to make their own. When they run out of ink they will be unable to write words or ciphers until their next trip to the settlement. This is a sad commentary on modern education." From FTA Gazette, 1941: "Students today depend on these expensive fountain pens. They can no longer write with a straight pen and nib. We parents must not allow them to wallow in such luxury to the detriment of learning how to cope in the real business world which is not so extravagant." From Federal Teachers, 1950: "Ballpoint pens will be the ruin of education in our country. Students use these devices and then throw them away. The American values of thrift and frugality are being discarded. Businesses and banks will never allow such expensive luxuries." From a fourth-grade teacher in Apple Classroom of Tomorrow chronicles, 1987: "If students turn in papers they did on the computer, I require them to write them over in long hand because I don't believe they do the computer work on their own." From a science fair judge in Apple Classroom of Tomorrow chronicles, 1988: "Computers give students an unfair advantage. Therefore, students who used computers to analyze data or create displays will be eliminated from the science fair." Breathtaking, isn't it? "Deniers" from 1815 to 1988. I remember business owners back in the 90's exclaiming, “Why would I ever need a computerized accounting system?” Three years later, most of those suppliers were gone. Do you hear similar comments? Yes, everyday. OEM sponsored ‘studies’ reporting how office print is rising or a blog projecting paper as the preferred knowledge transfer medium appear almost daily; more signs lamenting "pen-knives" and "store bought ink". I hope you're not telling your employees or prospects, they don't know how to "write on a slate without getting chalk dust all over themselves" or "Ballpoint pens will be the ruin of education in our country..."
Robots are replacing jobs like never before, and that's okay. The business world is evolving away from paper - processes are quicker and more efficient when utilizing digital conveyance of information, and that's okay. Technology will be the great equalizer, women will be paid the same as men, minimum wage may end up at $40.00/hr, but cashiers and order takers will be replaced with the aforementioned robots. And that's okay. Study history, recognize the signs, see the future, flow through the now. Curious about your future? Interested in technology as a catalyst? Join us for a thrill-packed, riveting, web-event, "The Future of Everything", May 19, 2016. Is Managed Print Services Making a Comeback?